Many Los Angeles area residents associate the name “Rose Hills” with a large cemetery near Whittier. 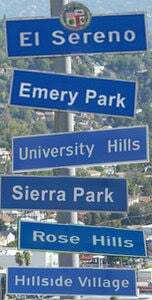 But it is also the name of a hillside neighborhood on the western edge of El Sereno. Rose Hills, the neighborhood, stands to get a little more attention under a proposal by Councilman Jose Huizar to install “Rose Hill” community signs on Monterey Road near Hermon, Soto Street near Mission Road and Huntington Drive near Collis Avenue. A major advocate of Rose Hills history and identity has been resident and LA 32 Neighborhood Council President activist Anthony Manzano, who has claimed that Rose Hills is Los Angeles’ oldest neighborhood. As time progresses … it is recorded that Ostungna became Rancho Rosa de Castilla and a map of 1852 indicates that the area north and east of the Pueblo was one Ranch. The name Rancho Rosa de Castilla is still carried slightly by the name of the street that is used at Cal State L.A. … and the community of Rose Hills still carries the name true to the Native Tongva Indians for over 7,000 years.